Just like his life and his death the origin of Swami Dhirendra Brahmachari is shrouded in mystery. Some say that he was born in a respected Brahmana family of Chandpura, a small village in Bihar in Northern India. Others say that he came from a village in Kashmir. There are no records of the day of his birth, and during his lifetime there was speculation about his real age. He never talked much about his past, but when he remembered his early childhood he used to say that he was a wild, adventurous and naughty boy and often got in difficult and dangerous situations. When he was twelve he started to read the Bhagavad Gita and was deeply impressed when Krishna says to Arjuna: “The Yogin is verily superior to the Tapasvins (those observing austerities), Jnanins (the knowledge-ables) and Karmakandins (those who perform the ceremonial rites). Therefore you should try to become a Yogin!” So he decided to become a Yogi and pursued this arduous path with great devotion and deep interest. He left his family to search for a true Guru, and during these restless years he met many Sadhus and holy men. But it seemed impossible to find a true, personal Guru, because most “masters” turned out to be charlatans, or they were demanding a certain hairstyle or dress from him, changes which the stubborn young man wouldn`t accept. After years of arduous search he ended up in great poverty, and he seemed to be stranded. 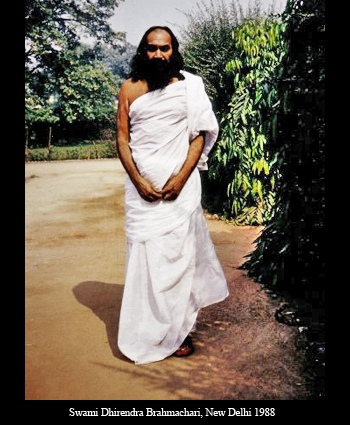 He said about this dark period of desperation: “I had completely lost the idea of a Guru, my mind was absolutely empty. But only when life becomes dark and black like a slate, you can start to write something new. Only where there is absolute emptiness you can fill in something new. Only when his own ideas are wiped out, man is ready to perceive and accept the Absolute. 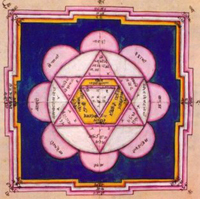 It is a balance between complete devotion and the openness for the Divine or even for what you can call its opposite.” While this struggle between light and darkness was in full swing, he finally met his Guru Maharshi Kartikeya, whose Ashram stood at Gopal-Khera, about twelve miles from Lucknow. There his Guru initiated him into the untold secrets of Yoga. He practiced Pranayama in an underground cave and reached a state of perfect mental equilibrum, which made him enter the realms of higher Yoga. 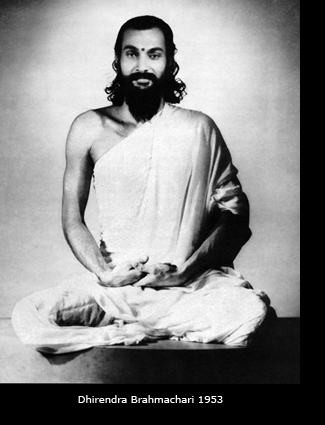 Now he was a Swami, a Siddha and Yoga-Master, and he was directed by Maharshiji to propagate the Yogic Kriyas. It was in the Bengal capital Calcutta that his first work “Yogic Sukshma Vyayama” was published in Hindi in 1956.Thereafter he came to Delhi and people of all walks of life and from all over the world were attracted to him to learn the yogic practices that he demonstrated. He taught the first Prime Minister of India, Jawaharlal Nehru, and was the yogic mentor to his daughter Indira Gandhi and her family. 1970 he published his second book “Yogasana Vijnana”, doubtless the best work ever about the correct practice of Yoga-Postures. Because of his extraordinary powers and his charismatic personality he became the counsellor and trustee of the then Prime Minister Indira Gandhi and therefore a political issue. He was running big Ashrams in Delhi, Jammu, Katra and Mantalai (J & K), and thousands of people from all over the world were eager to learn from him. In the year 1988 he shocked the public with the announcement, that he was ready to retire because of his great deception about the fact that so many people showed interest in yoga but none was ready to sacrifice himself to become a real Yogi. He accepted Reinhard Gammenthaler as his last disciple and started to teach him, because this young foreigner showed a lot of devotion, eagerness and stamina for the yogic path. In the following years they spent long periods in Mantalai, where Swamiji initiated him into the mysteries of Kundalini-Yoga and helped him to build a solid foundation for future yogic realization. It was in the Vishwayatan Ashram in New Delhi in the beginning of june 1994 that he announced his final departure from this world to the unbelieving staff and students. A few days later, it was the 9 th june 1994, he crashed with a small airplane in the mountains near Mantalai (J & K).